The purpose of the guidance document is to assist industry participants in preparing submissions to the CER, which regulates these activities. It is also intended to provide the public with an understanding of the safety requirements that the CER places on industry. ALARP stands for as low as reasonably practicable. In essence, the principle of reasonable practicability means that a risk reduction measure must be adopted unless the sacrifice involved in implementing that measure is grossly disproportionate to the reduction in risk. It is commonly illustrated as follows. The tolerability limits for the ALARP determination are expressed in terms of individual risk (risk to a worker, risk to a member of the public) and societal risk (aggregating the risks for the population as a whole). The type of risk assessment required depends on the level of risk associated with the activity. Where there are no major accident hazards (as defined in the above-referenced safety frameworks) associated with the activity, a qualitative or semi-quantitative assessment will normally be sufficient. In such cases direct comparison with the tolerability limits is not required. Risk > upper tolerability limit: it is intolerable and the activity may not be permitted except in exceptional circumstances. 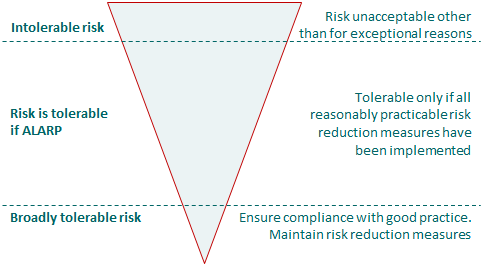 Risk < lower tolerability limit: the requirement is to demonstrate that relevant good practice has been identified and implemented and that there are arrangements in place to ensure ongoing compliance. Risk between tolerability limits: operator must identify all physically possible risk reduction measures. These measures must be implemented unless it is demonstrated and documented that it is not reasonably practicable to do so. The concept of good practice is a key element in assessing whether the risks associated with an activity are tolerable. It is defined as 'the recognised risk management practices and measures that are used by competent organisations to manage well-understood hazards arising from their activities'. These practices are identified by reference to guidance or codes of practice from regulators, standards from standards-making organisations, guidance by professional institutions or trade federations and/or lessons learned from previous accidents. If the risk assessment is inconclusive or uncertain, then the precautionary principle should be adopted in the hazard management process. The degree to which this principle is adopted should be commensurate with the level of uncertainty in the assessment and the level of danger believed to be possible. The concept of gross disproportion is used when assessing the practicability of further risk reduction measures in such cases. The guidance document, ALARP Guidance - Part of the Petroleum Safety Framework & the Gas Safety Regulatory Framework (CER/16/106), is available to download from the CER's website.